OMPL contains a ompl::Benchmark class that facilitates solving a motion planning problem repeatedly with different parameters, different planners, different samplers, or even differently configured versions of the same planning algorithm. Below, we will describe how you can use this class. For a command line program for rigid body motion planning and basic kinodynamic motion planning, see the ompl_benchmark program in OMPL.app. For interactive visualization of benchmark databases, please see plannerarena.org. Optionally, specify some parameters for the benchmark object using ompl::Benchmark::addExperimentParameter, which is useful when aggregating benchmark results over parametrized benchmarks. // A function that matches the ompl::base::PlannerAllocator type. // can be called. Setting up a planner is not needed. // We add the planners to evaluate. // do any cleanup, or set values for upcoming run (or upcoming call to the pre-run event). // when the log file is processed and saved as a database). // The values are always converted to string. 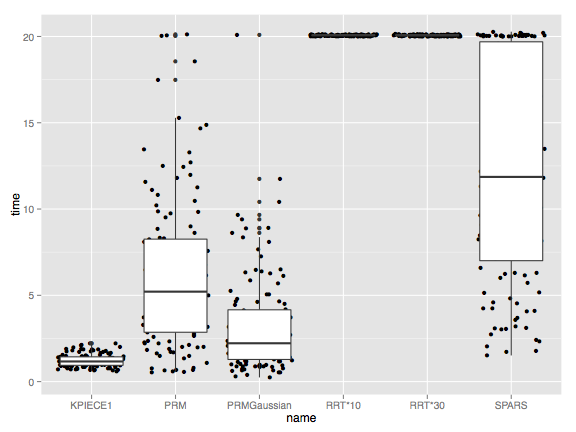 This will generate a series of plots, one for each of the attributes described below, showing the results for each planner. Below we have included some sample benchmark results. correct solution: (boolean) flag indicating whether the found solution is correct (a separate check is conducted). This should always be true. correct solution strict: (boolean) flag indicating whether the found solution is correct when checked at a finer resolution than the planner used when validating motion segments. If this is sometimes false it means that the used state validation resolution is too high (only applies when using ompl::base::DiscreteMotionValidator). simplified correct solution: (boolean) flag indicating whether the found solution is correct after simplification. This should always be true. simplified correct solution strict: (boolean) flag indicating whether the found solution is correct after simplification, when checked at a finer resolution. With the Benchmark class one can thus measure how the cost is decreasing over time. 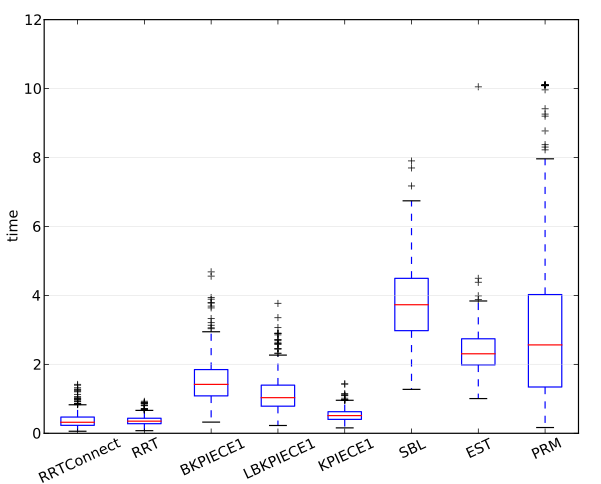 The ompl_benchmark_statistics.py script will automatically generate plots of progress properties as a function of time. Below are sample results for running benchmarks for two example problems: the “cubicles” environment and the “Twistycool” environment. The complete benchmarking program (SE3RigidBodyPlanningBenchmark.cpp), the environment and robot files are included with OMPL.app, so you can rerun the exact same benchmarks on your own machine. See the gallery for visualizations of sample solutions to both problems. The results below were run on a recent model Apple MacBook Pro (2.66 GHz Intel Core i7, 8GB of RAM). It is important to note that none of the planner parameters were tuned; all benchmarks were run with default settings. From these results one cannot draw any firm conclusions about which planner is “better” than some other planner. 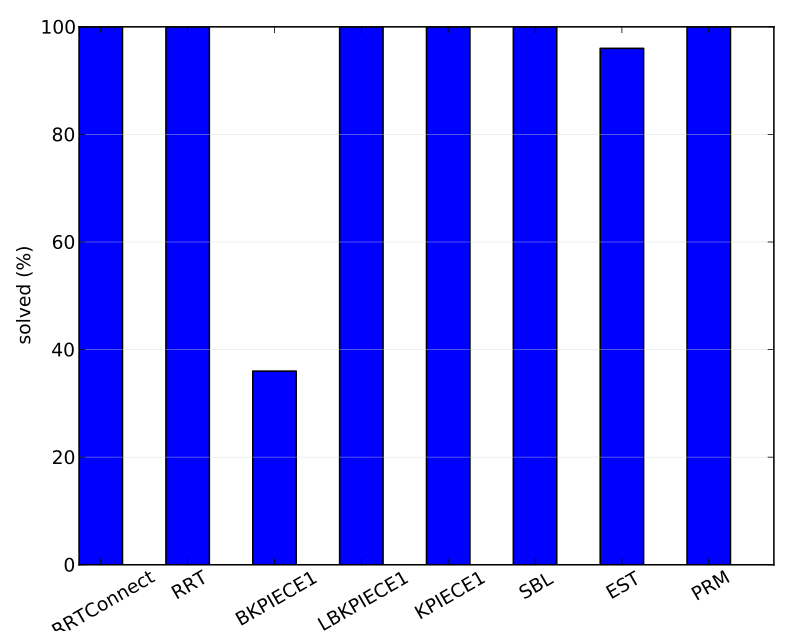 The plots show comparisons between ompl::geometric::RRTConnect, ompl::geometric::RRT, ompl::geometric::BKPIECE1, ompl::geometric::LBKPIECE1, ompl::geometric::KPIECE1, ompl::geometric::SBL, ompl::geometric::EST, and ompl::geometric::PRM. Each planner is run 500 times with a 10 second time limit for the cubicles problem for each sampling strategy, while for the Twistycool problem each planner is run 50 times with a 60 second time limit. Whenever measurements are not always available for a particular attribute, the columns for each planner are labeled with the number of runs for which no data was available. For instance, the boolean attribute correct solution is not set if a solution is not found. The benchmark log files have a pretty simple structure. Below we have included their syntax in Extended Backus-Naur Form. This may be useful for someone interested in extending other planning libraries with similar logging capabilities (which would be helpful in a direct comparison of the performance of planning libraries). Log files in this format can be parsed by ompl_benchmark_statistics.py (see next section). Here, EOL denotes a newline character, int denotes an integer, float denotes a floating point number, num denotes an integer or float value and undefined symbols correspond to strings without whitespace characters. The exception is property_name which is a string that can have whitespace characters. It is also assumed that if the log file says there is data for k planners that that really is the case (likewise for the number of run measurements and the optional progress measurements). id: an ID used in the runs table to denote that a run was part of a given experiment. name: name of the experiment. totaltime: total duration of the experiment in seconds. timelimit: time limit for each individual run in seconds. memorylimit: memory limit for each individual run in MB. runcount: the number of times each planner configuration was run. version: the version of OMPL that was used. hostname: the host name of the machine on which the experiment was performed. cpuinfo: CPU information about the machine on which the experiment was performed. date: the date on which the experiment was performed. seed: the random seed used. setup: a string containing a “print-out” of all the settings of the SimpleSetup object used during benchmarking. id: an ID used in the runs table to denote that a given planner configuration was used for a run. name: the name of the configuration. This can be just the planner name, but when using different parameter settings of the same planner it is essential to use more specific names. settings: a string containing a “print-out” of all the settings of the planner. name: name of the enumerate type (e.g., “status”). experimentid: ID of the experiment to which this run belonged. 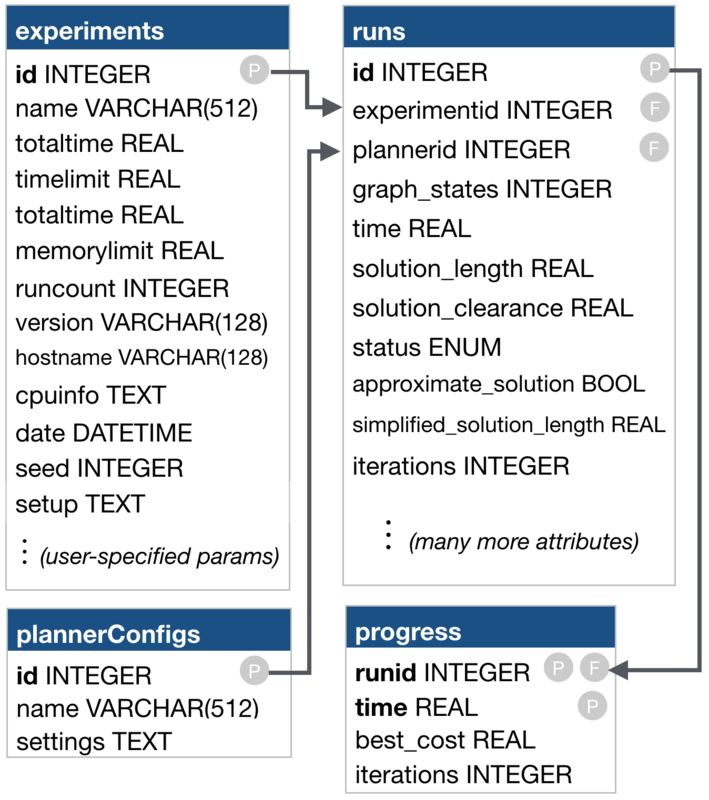 plannerid: ID of the planner configuration used for this run. In addition, there will be many benchmark statistics. None are required, but the OMPL planners all report the properties described above such as time, memory, solution length, simplification time, etc. It is possible that not all planners report the same properties. In that case, planners that do not report such properties will have NULL values in the corresponding fields. runid: the ID of the run for which progress data was tracked. time: the time (in sec.) at which the property was measured. iterations: the number of iterations. collision_checks: the number of collision checks (or, more precisely, the number state validator calls). best_cost: the cost of the best solution found so far. Time to find a solution. Note that that RRT* does not terminate because it keeps trying to find a more optimal solution. Length of shortest path found after a given number of seconds. Only RRT* currently uses progress properties. 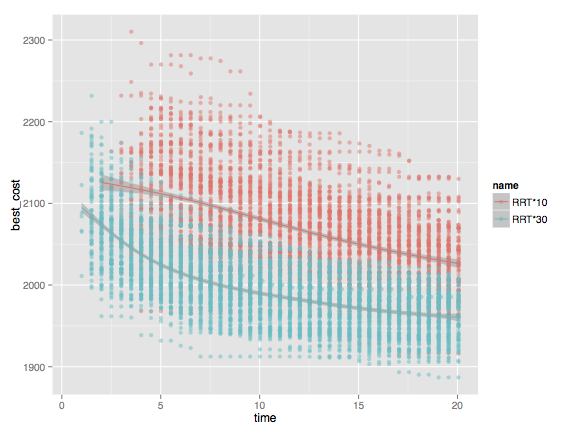 Although the variability among individual runs is quite high, one can definitely tell that different parameter settings (for the range in this case) lead to statistically significant different behavior. Similar code is used for Planner Arena, a web site for interactive visualization of benchmark databases. The Planner Arena code is part of the OMPL source. Instructions for running Planner Arena locally can be found here.